The online furor surrounding the ALS Ice Bucket Challenge – an awareness-raising charity event in which you are nominated to dump water over your head and donate to support research and treatment of the neurodegenerative disease ALS – may have settled down to a dull roar over the past week, but the viral event is by no means finished. 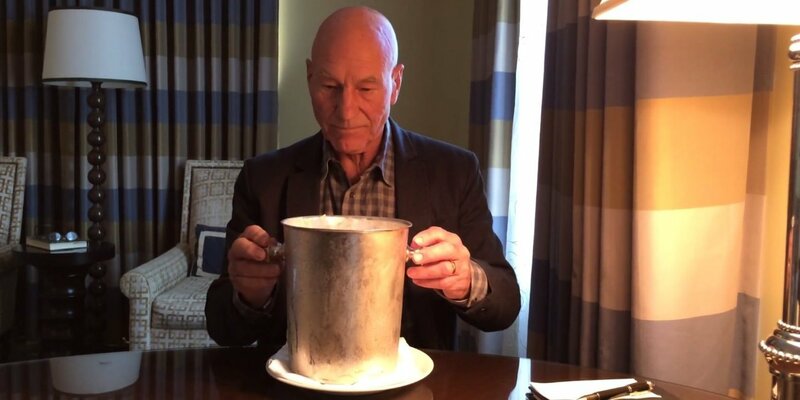 Anyway, here’s a second complication of British ice bucket efforts, including such luminaries as Dame Judi Dench, Sir Patrick Stewart, Dame Helen Mirren, Doctor Who star Karen Gillan and Helena Bonham Carter, among many other familiar faces. Click through, watch and rank your faves. The great Sir Patrick Stewart probably had the most original and creative take on the challenge – I’d still have to award the best effort to date to Sherlock star Benedict Cumberbatch and his epic five bucket dousing –but if you only manage to watch one of these clips, make it this one because Stewart is a genius. Stewart’s longtime friend and perfectly adorable BFF Sir Ian McKellen also took part, shooting his attempt on the set of his new film Mr. Holmes and bringing along an entire dance troupe to help him out. You may have already known that Dame Judi Dench is basically the world’s most amazing and perfect person, but prepare to have your admiration kick up about five notches when you realize that not only did she participate in the challenge – let’s face it would any of us have dared judged her if she hadn’t? – she did it in a white oufit. DAME JUDI DENCH-THE ICE BUCKET CHALLENGE! Video of DAME JUDI DENCH-THE ICE BUCKET CHALLENGE! Former Doctor Who companion Karen Gillan was nominated by her former co-star Matt Smith and rose to the occasion admirably, though why she decided to sport what appears to be a Pink Power Ranger costume is anyone’s guess really. Not to be outdone on the Dame front, the fabulous Dame Helen Mirren did her challenge in Italy with some rather adorable assistants. Game of Thrones’ Natalie Dormer and Merlin’s Katie McGrath did their challenges simultaneously and their clip is pretty adorable honestly. How did I miss that they were BFFs? And Helena Bonham Carter gets some help with her ice bucket from a familiar-looking assistant, and possesses a truly terrifying scream. All we really need now is Michael Fassbender and/or Peter Capaldi, yeah? Which celeb has done your favorite ice bucket challenge to date? Have there been any other notable attempts that we’ve missed? Telly Visions takes a moment to look back at the talents and contributions of those British entertainment figures we lost in 2017. Tea with the Dames is a candid peek at the lives of four legendary British actresses who are working artists, mothers and friends above all else. Judi Dench reprises her role as Queen Victoria in period drama "Victoria and Abdul". Here's a historical guide to all the figures in the film.